Why declare a Climate Emergency? Why an offshore NMBI campaign? We are running state-level No More Bad Investments (NMBI) campaigns specfically because state/territory governments have the primary power to approve or reject applications for new projects within their own jurisdictions. They can ban new climate-damaging projects, such as new onshore fossil fuel projects, but they have very limited ability to control offshore oil and gas projects in Commonwealth waters. A short Powerpoint presentation containing the main talking points can be downloaded here. NOPSEMA is responsible for the oversight and regulation of health and safety, environmental management, structural and well integrity for offshore petroleum facilities and activities in Commonwealth waters. However, the legislation which guides their decisions does not instruct NOPSEMA to consider the climate impacts of the new oil and gas extraction projects that they assess. The aim of the offshore NMBI campaign it to add a clause to the the NOPSEMA-related legislation instructing NOPSEMA to NOT approve new climate-damaging projects. 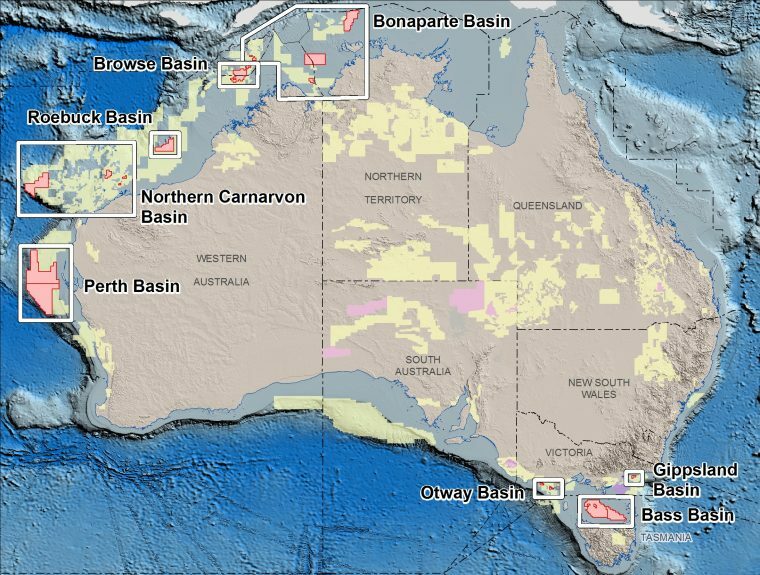 In effect this would mean a ban on any NEW offshore oil and gas exploration and extraction projects in Australian waters (with NOPSEMA continuing to perform its current function in relation to existing offshore oil and gas projects). Being offshore, almost nobody sees these projects. They’re not literally in anyone’s back yard. Every year the National Offshore Petroleum Titles Administrator (NOPTA) releases new offshore exploration areas and NOPSEMA gives approvals for new offshore oil and gas projects, often with little public scrutiny. State/territory governments are usually inclined to leave offshore project approvals entirely in the hands of NOPSEMA, but NOPSEMA recently gave approval for seismic testing off the NSW coast despite the objections of the NSW government. We know about plans to do seismic testing and drill for oil/gas in the Bight and off the NSW coast because local campaigners are fighting these approvals, but how many other applications are approved by NOPSEMA without any public awareness of them? Right now there are other applications being considered and/or recently approved for projects off the WA, NT, SA, and Victorian coasts. Exported oil and gas also flies under the carbon reduction target radar. Exports do not count against meeting federal or state carbon reduction targets even though they certainly have just as much impact on climate as if they did. 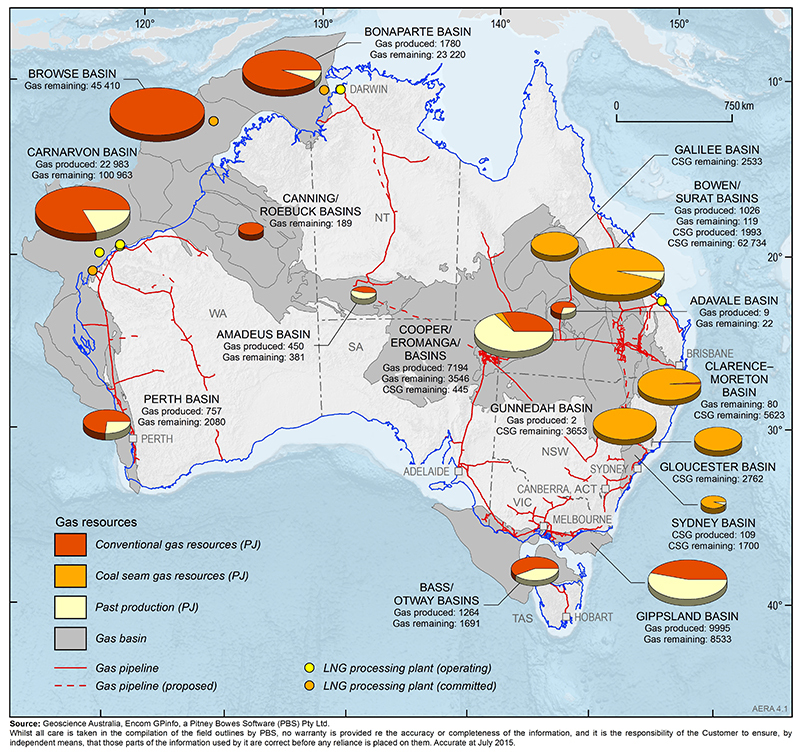 Australia already produces twice as much gas as we use here, so the gas from any new offshore (and onshore) gas extraction projects will almost definitely be exported (or an equivalent amount from other gas projects). Oil from new offshore projects is also quite likely to be exported, partly because Australian oil refineries are unable to process a lot of the oil extracted here due to its composition. Do we need more gas? Probably not. 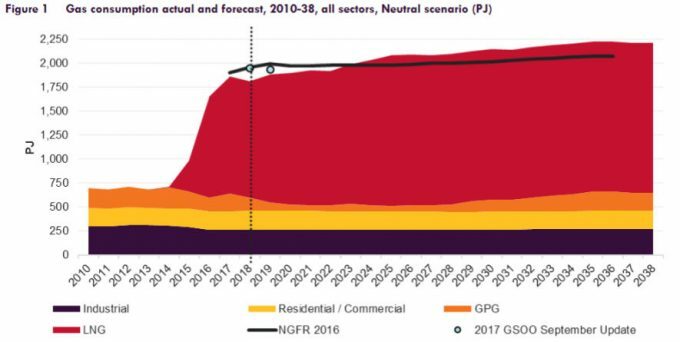 Supporters of the gas industry would like us to believe there is an east-coast gas shortage, but we already extract three times as much gas as we use here for electricity generation (the orange bar labelled GPG below) and for residential, commercial, and industrial purposes. The map below shows the amount of gas still remaining at existing gas extraction sites. Now we don’t kow how much of that gas has been committed in export agreements, or what backroom deals governments may have made with gas extraction companies in order to guarantee exports don’t leave us short. But regardless of that, given the climate emergency, there must be better ways of ensuring we have sufficient for a smooth transition away from gas use other than extracting yet more gas. Unlike onshore projects, offshore oil and gas projects don’t pay state royalties. But they are subject to the Petroleum Resource Rent Tax (PRRT) that applies to both onshore and offshore gas and oil extraction projects. In practice, new offshore projects will not pay any tax at all (PRRT or income tax) for many years, and no royalties. 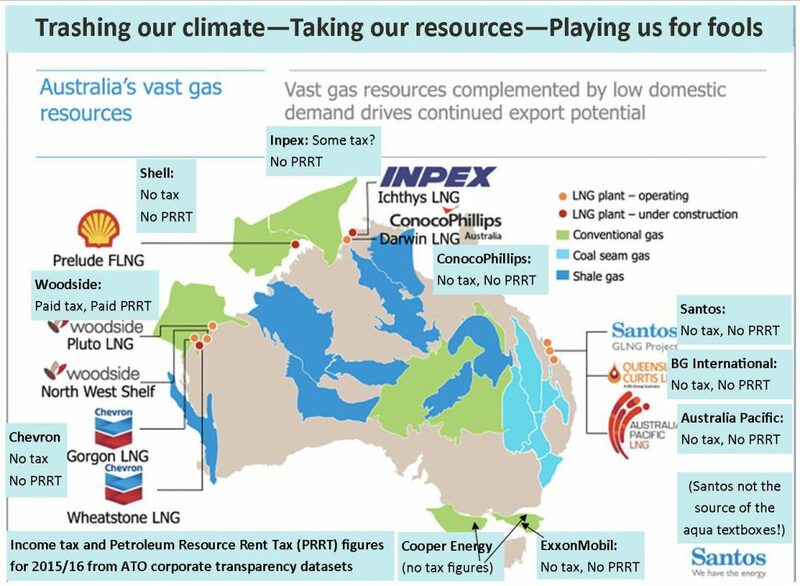 The map below includes examples of taxes paid and not paid by LNG gas export companies (from onshore and offshore gas). The PRRT is designed as a ‘super profits’ tax, meaning no PRRT is paid until all the exploration, establishment, and extraction expenses have been recouped and a clear profit is being made. All expenses count towards PRRT credits and they compound each year in such a way that, under current gas and oil prices, new gas and oil projects are unlikely to pay any PRRT for the first decade or more. Even the expenses involved in cleaning up an oil spill would ‘count’ as PRRT credits, meaning in effect that the Australian taxpayer would cover the cleanup cost if an oil spill occurred. For example, the major Ichthys project off the WA coast, owned by the Japanese company Inpex, and their Darwin LNG export facility are currently under development and nearing completion. NOPSEMA has already given approvals for various stages of the development work over the last few years, and in March 2018 accepted their environmental plan. Inpex have already forward-sold all the gas for the first 15 years to Asian LNG customers, and will only supply gas to NT in an emergency. Did NOPSEMA or the Treasury ask Inpex what they planned to do with the gas before that project was approved? We’ll receive nothing in state royalties because it is offshore, we’ll receive nothing in PRRT for a decade or more, and probably no income tax either due to PRRT credits. Yes, the construction stage of this project has generated welcome jobs, but most of those will finish soon. Jobs are also generated by new climate-safe projects. Generating jobs should never be considered sufficient reason to approve new climate-damaging projects. Please visit and LIKE our Facebook page! To join cedamia’s Facebook Group, click here. To sign up for e-news, click the email icon below and tell us the name, email, and postcode you want to sign up. Banning new fossil fuel extraction: what will it cost us?